I'm joining Between Naps on the Porch for Metamorphosis Monday. 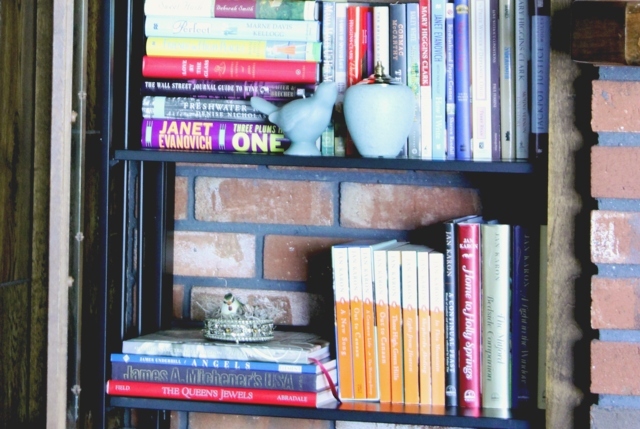 I have a glitch in decorating my bookcases. The word glitch in the Webster's New World Dictionary means "malfunctioning" that's me. I try and try, but there is some work to be done. And, it's all my camera's fault. LOL. So now for the Metamorphosis. My Girl Scout Handbook (intermediate program) is a treasured book. My father gave the book to me for Christmas in 1951. My husband was in the Boy Scouts and the Handbook for Boys is his very prized possession. Oh my! 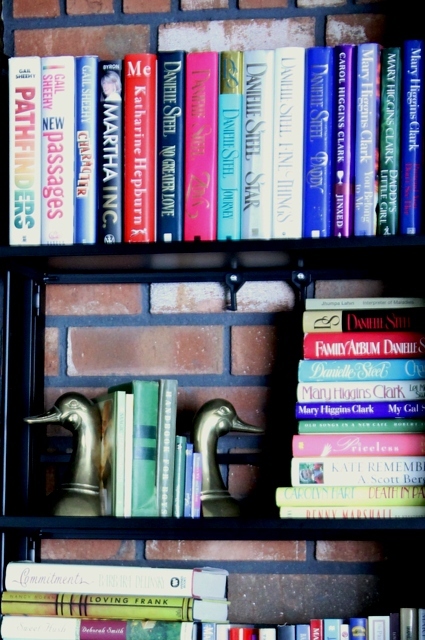 Do you see my collection of the Mitford Series? 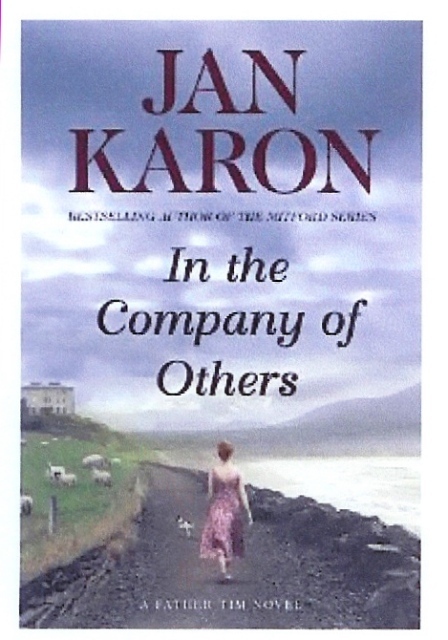 Yes, I have waited two years for the second book of the new series 'In the Company of Others' by Jan Karon to be released. With Home to Holy Springs, author Jan Karon launched a new series, The Father Tim Novels, featuring the retired Episcopal priest. I love the new series and can't wait until the new book 'In the Company of Others' is released. I pre-ordered my book a month ago. Hopefully it will be delivered by October 19th. The release date. Now for another bookcase dressed up. My son Patrick carved the large duck when he was in school. And, the plate is a thrifty find. I love to put it out in the fall. 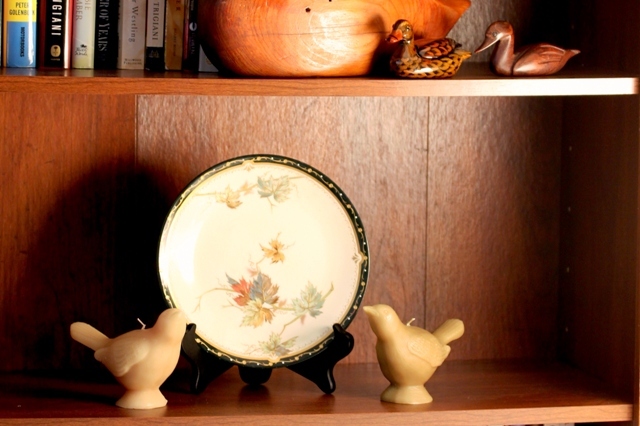 The two bird candles have been around for years. 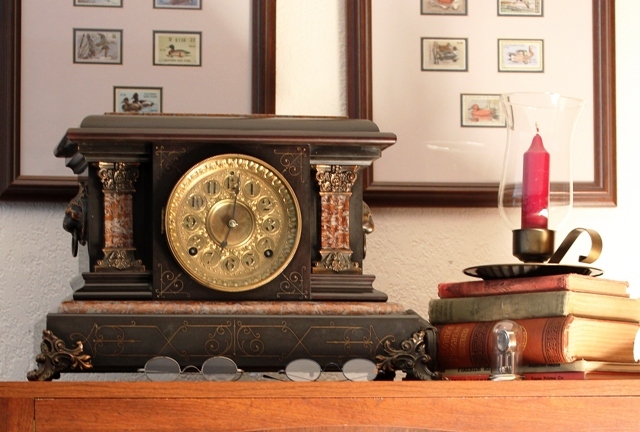 The clock is an antique 'Seth Thomas' and the old books I found at a garage sale earlier this year. The little old glasses were given to my husband by a good friend. My husband loves to hunt ducks in the winter. 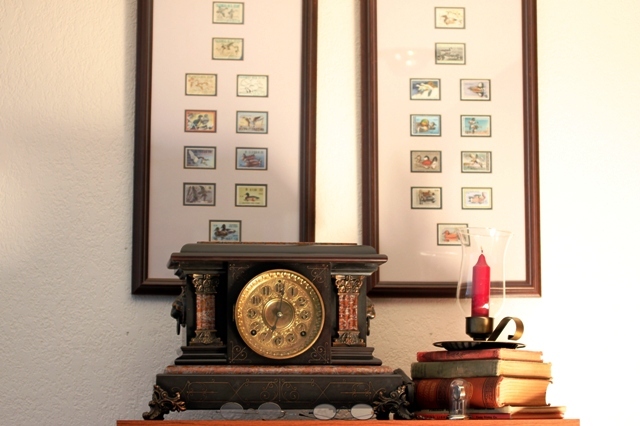 He had saved some of his Duck Stamps for several years. So, one year as a birthday gift I decided to have the stamps matted and framed. Federal Stamps and California Stamps. They are beautiful works of art. And, it is an honor to be selected to design a new stamp each year. We have seen a fabulous exhibit of California Duck Stamps from the rough drawings to the beautiful finished stamp design. Just amazing. Hope you have enjoyed your visit. As always I have had the most fun creating this blog. It is more fun to give than to receive. I am also joining A Stroll thru Life for Tabletop Tuesday. I very much like this autumn mosaic! Very wonderful. Love the ducks! The clock with the glasses is such a cute touch. 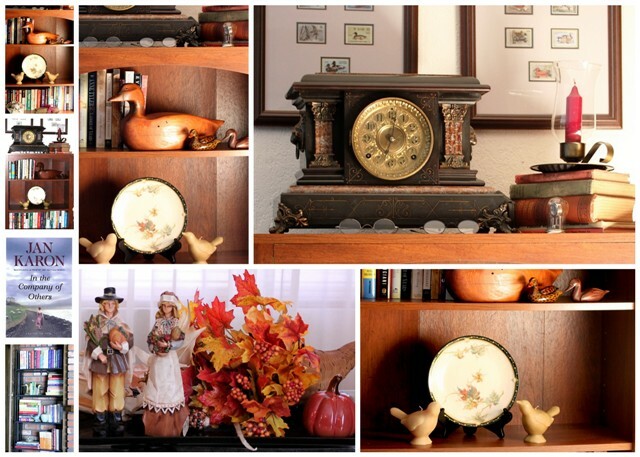 What charming treasures you have, I especially like your old clock. It's so nice to have something from your son. 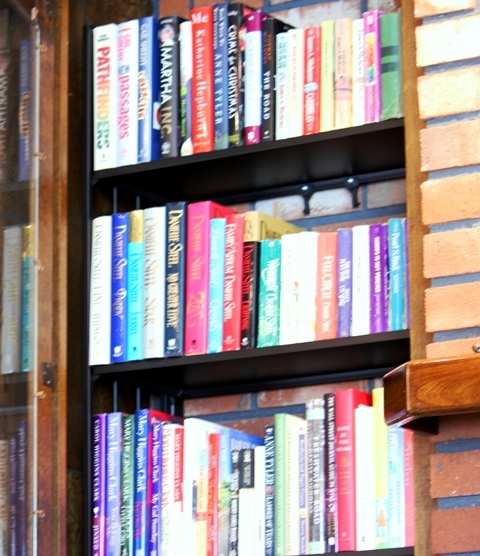 I hope to convert part of my home office into a library one day. So many books. So little space. 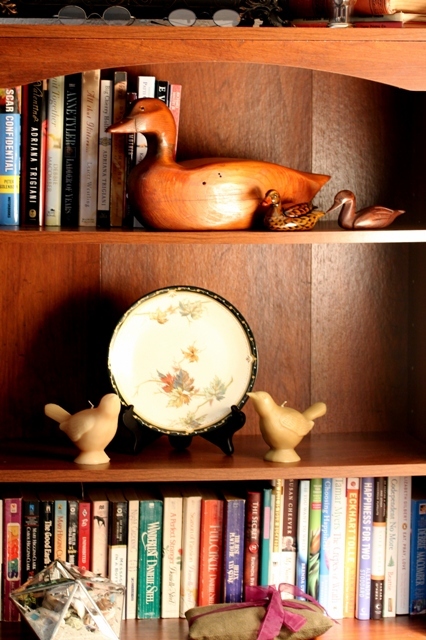 Your shelves look great. I love Jan Karon. Didn't know she had a new series. I'm so behind! I didn't realize that there was another book coming out so soon. 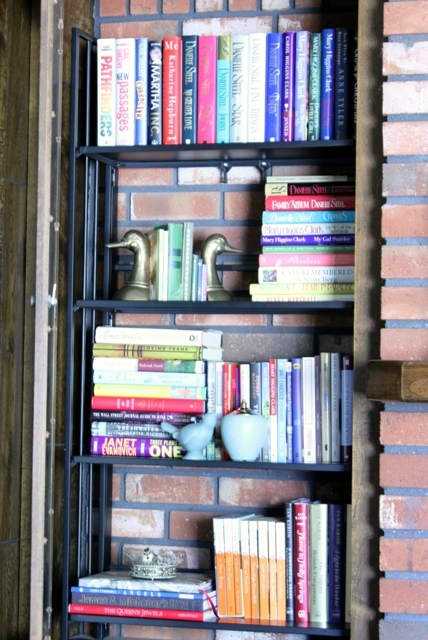 Thanks for that!....and your bookcases are looking great! Betty, you're like me... a book collector, but I never find the time to read!